Western themed Christmas ornaments and decor, such as the Cowboy Santa pictured here, are quite popular. Several years ago, my daughter's family lost almost all their Christmas things during a major move. Somehow, the items were forgotten and left in the basement, not to be remembered until the following Christmas, many months later. They had purchased one really nice Christmas collectible for each of their children every year since their birth, so it was a big deal to all of them. The idea was that when the kids were grown and had homes of their own, they would take their Christmas decorations and collectibles with them for their new homes. Needless to say, they were all devastated. That year, for Christmas, we decided to help her rebuild the collection. We purchased her a western Santa Claus in jeans, buckskin jacket, and cowboy hat holding a tin coffee cup in his hand. We also got her a wagon with a southwest decorated Christmas tree in the bed with tons of gifts beneath it. She was so excited when she opened it. I have not been able to find anything quite like what we purchased that year, but I did locate this Christmas figurine with lasso, boots, hat, jeans, and lantern. He would be a perfect companion piece to the one she already has. 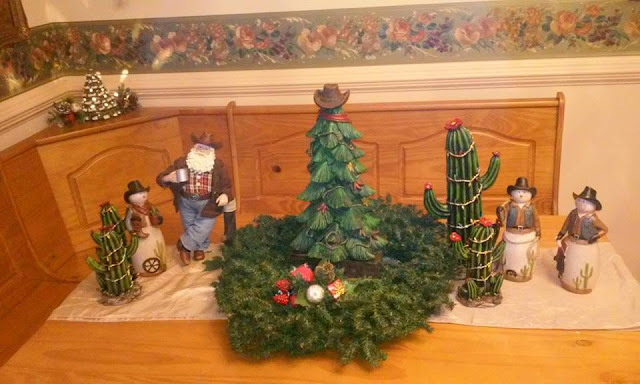 That first year, each of the kids got a small cactus Christmas tree figure and a cowboy snowman to help them start rebuilding their collections, too. Since then, she has managed to rebuild the collection to some extent, but I still hear one of them talk about the things they left behind. Where ever they may move in the future, they may leave something behind again, but I don't believe it will be their Christmas decoration collection. Won't you guide my possee tonight? I tried to find copyright information on this song, but was not able to find it. If you own the copyright, let me know and I will be happy to remove this song or attribute it to you. Perfect Music for a Cowboy Christmas! The following songs are on this album, and are available as individual MP3's! 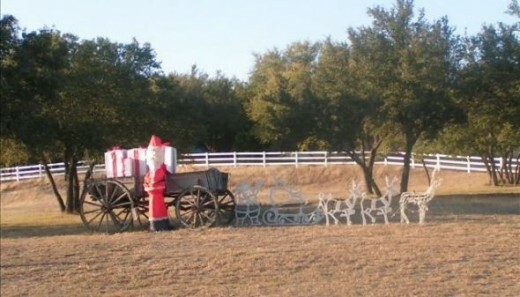 Merry Texas Christmas You All! I have heard of themed Christmas trees for years. The first time I actually saw a themed tree in someone's house, though, it was really fun to see. She had a huge house with a differently themed tree in each room. Her daughters had a Barbie themed tree. Her husband had a hunter's theme tree with homemade Santa ornaments made from shotgun shells that were just adorable. She had a western themed tree, too, with boot and hat ornaments, bandana bows, and a rope for garland. Instead of a star or an angel, that tree sported a cowboy hat on top. This Old World Christmas Western Horse Ornament would have been perfect on that tree! While driving through Texas, we came across this pasture decor. Would you like a western cowboy themed Christmas?